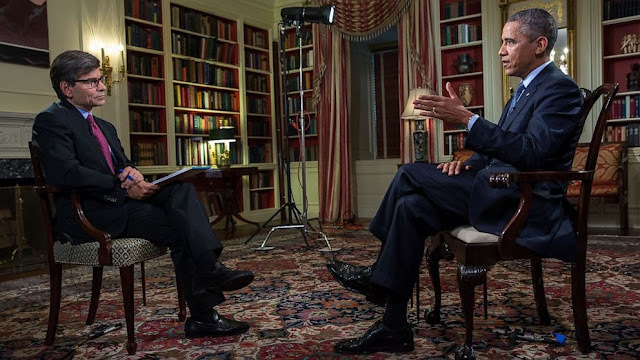 President Barack Obama confirmed publicly for the first time on ABC’s “This Week” that he has exchanged letters with new Iranian President Hassan Rouhani. Obama also said he believes his threat to use U.S. military force in Syria, and subsequent pause to pursue diplomacy, sends a signal to Iran in the ongoing dispute over its contested nuclear program. “What they should draw from this lesson is that there is the potential of resolving these issues diplomatically,” Obama said. So far, the Iranian reaction to U.S.-Russia deal has been noticeably mute. President Rouhani and Foreign Minister Zarif, who had spoken out against the use of chemical weapons and any military response to recent chemical attacks in Syria, have not yet reacted to the agreement. However, Majlis Speaker Ali Larijani said today the deal between Russia and the U.S. for the destruction of Syria's chemical arsenal was a sign of “rationality” in American behavior. The agreement requires Syria to account for its chemical arsenal within a week. The international inspectors will then have to destroy the chemical stockpile by middle of 2014. The comprehensive agreement also requires Syria to dismantle the manufacturing facilities and to never again produce chemical weapons. Meanwhile, Israel cautiously welcomed the Syrian deal, saying implementation is key. U.S. Secretary of State John Kerry will make a brief stop in Jerusalem on Sunday to brief Israeli Prime Minister Benjamin Netanyahu on the US-Russia deal. Kerry will then travel to Paris to brief his French, British and Turkish counterparts Laurent Fabius, William Hague and Ahmet Davutoglu respectively. He is also scheduled to meet with Saudi Foreign Minister Saud Al Faisal while in Paris. after Iran/Hibullah threat them to retaliate in Irak and Israel. USA and Israel for the win. They totally stripped Syria. What a diplomatic victory!!! It's pretty clear that Russia cannot and is unwilling to provide a proper military shielding to their subservient "friends", they can only persuade their "servants" to give in to Western demands and thus limit the harm being perpetuated on them. The days of the Warsaw Pact are long over, and with it went the Russian military might. NATO has global hegemony now. Anything anybody else says, to the contrary, is nothing but pure fantasy. this is a victory on IRAN and the resistance front! !MAY THE ALMIGHTY bless our brothers and sisters in the Iranian defense industries!! Through this diplomatic achievement, the U.S. can have Syrian chemical arsenal destroyed within few month and Syria is required to dismantle the manufacturing facilities and to never again produce chemical weapons. Such huge outcome could not have been achieved so quickly through use of military force, although the credible threat of force was the factor that brought Russia and Syria to the negotiating table. A win-win situation for all. Interesting that you believe that destroying Assad’s chemical arsenal and not letting him manufacture chemical weapons ever again is a victory for Iran and anti-Israeli front in general. Could you elaborate? Did you expect that those chemical weapons could eventually be used against Iran and Hezbollah if Assad fell? "The new situation means in fact that any pretext for the United States and certain countries to engage in military action against Syria has been removed,"
"We can even talk of a success by the front of the resistance (against Israel)"
I wish they would tell us the rationale behind the thinking that an agreement to destroy Assad's chemical arsenal and the manufacturing capabilities is a win for Iran and Hezbollah. Probably they are concerned that these weapons would fall in the hands of anti-Assad rebels. An American activist says that the main concern of the United States and Israel is Iran, as the US tries to assure Israel of a deal to remove Syria's chemical weapons. “There is no question that Netanyahu’s main concern and Washington’s main concern is not Syria, that’s side show, Iran is the main consideration,” said Steve Lendman. “Obama’s countdown on Syria continues. The idea is to replace Syria’s government with a pro-Western one. Isolate Iran and then target Iran. That’s the dirty plan, that’s a longstanding plan,” Lendman said. In the large scheme of things, Syria's Chemical arsenal is strategically useless against the Zionist state. Saddam was supplied chemical weapons by the US against Iran but he still couldn't win the war. It only slowed Iran's progress for a short while until Iran found counter measures to it. Hezbollah managed without Chemical weapons to defeat the Zionist IDF with only rockets and anti-tank missiles alone - something Syria has in abundance and produces in the thousands. This deal lets Syria off the hook for any future Chemical attack. They cannot be blamed for any false flag CM attack anywhere in the region, thereby taking away any excuse the US and her tag-alongs might have used to launch an attack. A clever diplomatic move the US never anticipated. Their main goal was to remove Assad but now they've been lumped with getting rid(some of it) of Syria's chemical weapons arsenal, free of charge (a very expensive process). Iran and Russia will make up for the different in deterrence by supplying Syria with even more powerful missiles, arms etc etc. The Zionists state also just lost any excuse to attack Syria. The next time they attack Syria and claim it was because of Chemical weapons, Syria will have the legal justification to strike back mercilessly without risking any political backlash. Syria also just won the moral high ground in the global community (not the fake "international community"). Iran's always been against CM and this is welcome news, indeed..
And by the way, if push comes to shove, Syria can easily manufacture the CM again if they feel really threatened - the technology and knowledge is already there and you can't bomb knowledge. Back to square one again. Wash, rinse, repeat. Uskowi, probably because the deal regarding Syria's chemical weapons means that the USA and its zionist masters have lost their excuse for starting a war with Syria. And the Mark should be blessed too. http://www.youtube.com/watch?v=6HDu3A1NkeU --- President Obama on Assad's use of WMD. Uskowi, are you disappointed now that the American excuse for attacking Syria has been lost? You are an ignorant person, and silly too. I always thought avoiding military confrontation in Syria was in the best interest of the United States. Disarming Assad of all chemical weapons without firing a shot was the best possible solution in an otherwise situation. ... in an otherwise difficult and messy situation.